Properties in Ellenton average 4.7 out of 5 stars. Spacious 3/2 Home in cozy 55+ community! Property 4: Spacious 3/2 Home in cozy 55+ community! Breathtaking Sunsets! 3 Bedrooms With Rec Room And Bar! Property 5: Breathtaking Sunsets! 3 Bedrooms With Rec Room And Bar! Indulge in a life of leisure and luxury with this stunning waterside mansion. Property 7: Indulge in a life of leisure and luxury with this stunning waterside mansion. Luxury Waterview Mansion + Chef, Massage Therapist, Bar Tender, Maid, Limo Bus, 24/7 Concierge! Property 9: Luxury Waterview Mansion + Chef, Massage Therapist, Bar Tender, Maid, Limo Bus, 24/7 Concierge! Lakefront private community home w/ heated pool & private dock, newly updated! Property 11: Lakefront private community home w/ heated pool & private dock, newly updated! Incredible home with private pool, lanai, and amazing location! Property 12: Incredible home with private pool, lanai, and amazing location! Fabulous View of Pool/Pond! Minutes to Beaches & Dining SPECIAL $80/nite Rates!! Property 17: Fabulous View of Pool/Pond! Minutes to Beaches & Dining SPECIAL $80/nite Rates!! Escape to your piece of island paradise by the beach! Paradise Awaits! Property 24: Escape to your piece of island paradise by the beach! Paradise Awaits! Holmes Beach Hideaway - Seascape Look us up! Property 31: Holmes Beach Hideaway - Seascape Look us up! Ainsley Beach House: Awesome Villa, Private Heated Pool, Tiki Table, Waterfall!! Property 36: Ainsley Beach House: Awesome Villa, Private Heated Pool, Tiki Table, Waterfall!! Spacious Condo in Longboat Key Resort: Pool, Tennis, Bikes, Beach Access!! 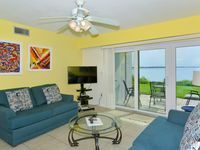 Property 39: Spacious Condo in Longboat Key Resort: Pool, Tennis, Bikes, Beach Access!! Water front with a dock, cage pool and covered grill and dining area. Property 41: Water front with a dock, cage pool and covered grill and dining area. Cheerful condo w/ patio & shared pool/tennis - walk a few steps to the beach! Property 43: Cheerful condo w/ patio & shared pool/tennis - walk a few steps to the beach! Adorable beachfront rental in great location - Gulf access right outside! Property 44: Adorable beachfront rental in great location - Gulf access right outside! Coquina Reef #9! 1 Block From Beautiful Bradenton Beach! Property 46: Coquina Reef #9! 1 Block From Beautiful Bradenton Beach! Amazing beachfront condo with Full panoramic view and many extras. Property 47: Amazing beachfront condo with Full panoramic view and many extras. Completely Renovated. Panoramic beach View and amazing Sunset. Property 48: Completely Renovated. Panoramic beach View and amazing Sunset. We really enjoyed staying at the Moorings. Great layout. Great pool area. We even caught a few fish off their dock. We bought fishing rod/reel combos before we got there. We left there so that others can use them during their stay. Great area. We enjoyed Emerson Point and Desoto Park as well as Coquina Beach and Lido Key. Lots of great restaurants nearby. Would definitely recommend to a family of four/five or two couples with children.